Wendy Elia trained at St Martins School of Art, London and has exhibited widely. 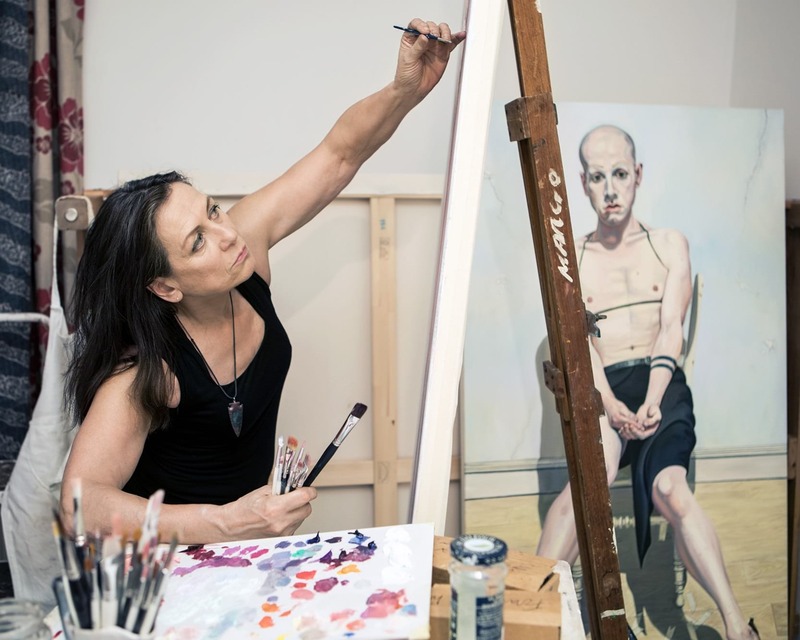 She has been a finalist in national and international competitions at National Portrait Gallery, The Sovereign European Art Prize, The Threadneedle Prize and more. Her work is also held in a number of public permanent art collections across the country. I have always been an arty type. I had a keen interest in both music and painting. As a child I was told once by a teacher that I was good at painting, which was very encouraging and probably the cause of all this. But being rejected by Hornsey school of art at 16 years old (because of my age (they said)), I decided to transfer my energies to music and spent some years in bands before returning to painting. What is your usual process for making a painting? It varies considerably. It usually starts with an idea of what I want to say. Then the thinking around how I might say it. Then the research and organising of that research which may or may not include painting from life or from photographs. Then building the canvas. 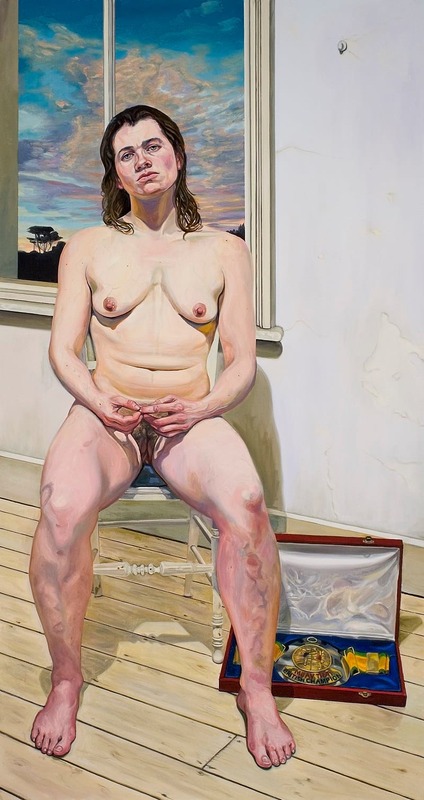 Freud; Sarah Lucas; Carravagio; Cranach; Valesquez; Rubens; Freud; Wonnacot; Sonia Boyce. 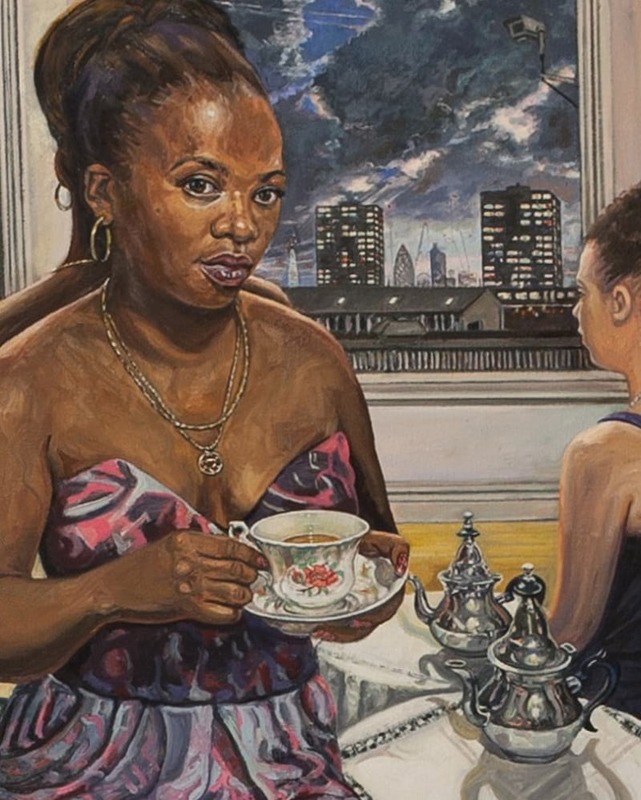 Your artist statement mentions that your portrait work ‘asks questions about the female gaze and painting’s relationship to authenticity and illusion’. Can you expand a little on what you mean by that (perhaps with an example of a painting)? As I tend to work in series, in the paintings of people the models are usually my friends or family. If not we have become friends by the sheer intimacy of that ‘sublime scrutiny’ (or on rare occassions not friends by the end of the sessions). 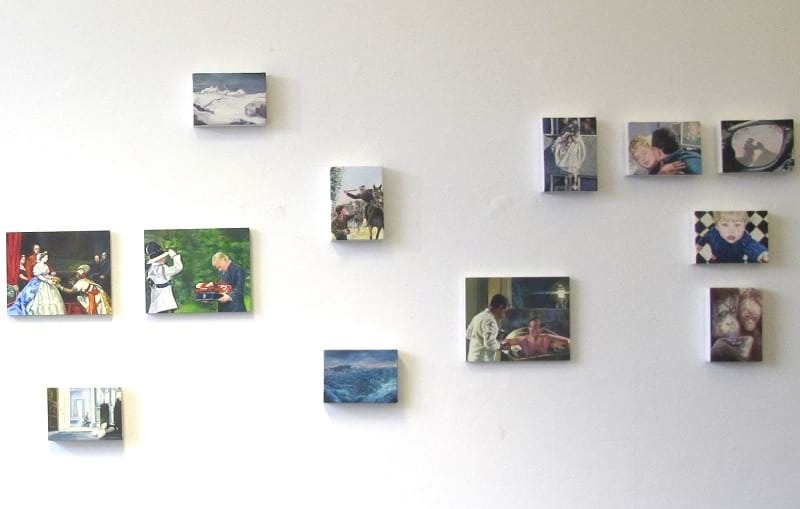 In these ‘series’ of figure paintings the work is generally about identities and how we perceive them and indeed might invent and manipulate them. 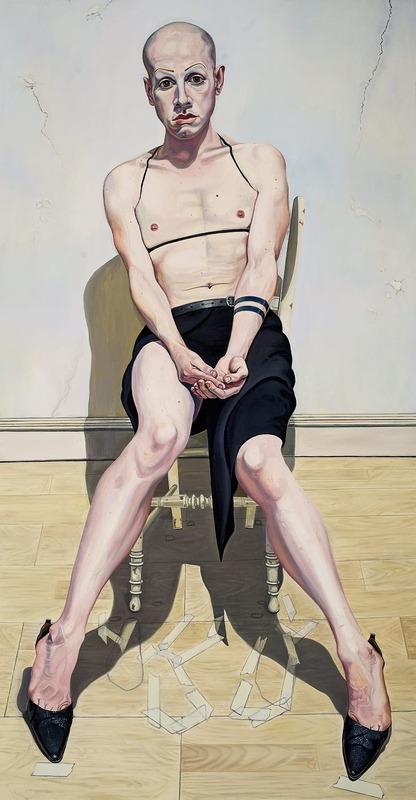 I have no interest or skill in capturing someones ‘inner personality’ or character, though sometimes this might happen by default, as the poses are chosen/negotiated with the sitter and also whether the sitter is clothed, part clothed or fully naked before starting. 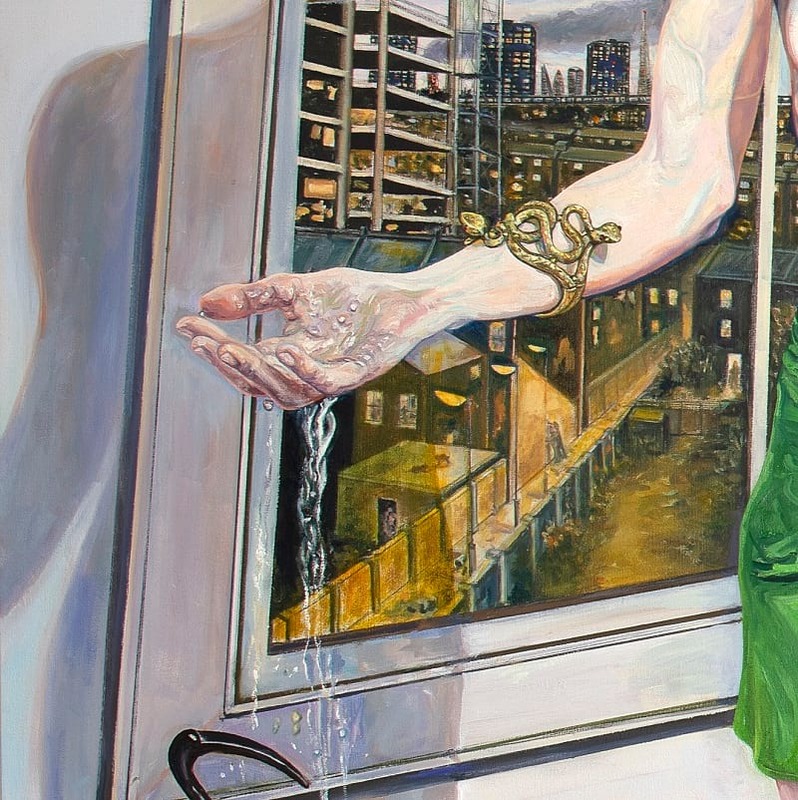 All painting is illusion, artifice, a construct made by the artist. Every single part is composed within a chosen format, with constructed lighting, focus, props, clothes, pose etc etc. Then the alchemy of transcribing from eye to paint and then to surface… and then of course there is the viewer’s part to play in that construct. For me, at least in the observational paintings… Is it when the object itself actually becomes the thing it truly works? (To smell the flesh and not just see it)…. Not when it “looks so real” or “looks just like a photograph” (the worst ‘compliment’ anyone could give a painter, I think). Wasn’t cubism about trying to show a more truthful representation of the ‘real’ world? In other series like the “I used to perspire freely…” it is the use and juxtoposition of images from newsreels, newspapers, film, TV, old mistress/master paintings, text. Here sometimes it is hard to seperate these images ….are they from news or scenes cut from a movie? They are about various forms of control: State, Patriarchial, Coercive, Colonial. In these, it is hard to distinguish the ‘Truth’ in all this bombardment of Imagery. I am (as most of us are) only witness to the image not to the event. This is my “relationship to authenticity and illusion” in this instance. There have been a number of stylistic and process evolutions in the work (around every 7 years, like moving home or relationships) I appear to have come full circle from where I started. I suppose the content has remained consistant. Women. Gender. Motherhood. Identity, Truth… my friends and family, me me me. And then sidelong glances at the social and political goings on in the world outside, from a privileged viewpoint of relative safety of course. I was very very pleased, about being made an Academician of RWA this year. I have never fitted in easily with groups and institutions, but I have found the RWA members and staff, welcoming and friendly. The most important thing is that they want to talk and hear about my work and ideas, and seem to appreciate it/them, which is all any artist wants really…support! I hope to be able offer some of my time, ideas and support back. It is an honour! The problem is not a lack of ideas, but far too many. The ability to edit and make clear decisions is the most crucial element in making ‘good’ work… any work. So what do I want to say? Have I got anything left to say? Should I just experiment and observe the world for a while. Is painting relevent? Does it matter? Am I any good anyway? Should I get another dog? Can a female artist really become great if they have to care for a dog? I could become an art critic or a collector and be fêted by sycophants. Last time I gave up I became a Thai boxer and martial arts instructor, I even competed in the ring a few times…lost a few teeth…developed a 6 pack…. but I was just as miserable as ever, so I painted the female fighters. See ‘Nick (champion)’. Result! There is a big trend for surrealism at the moment -should I jump on that bandwagon? But I have always found it hard enough dealing with the real world, let alone the subconcious and the afterlife… I need to get out more! I am reminded of a quote someone told me the painter John Wonnacott had told him when a student: “I don’t want to get inside someone’s head, I want to look out there at the splendour and drama of what’s happening in the real world in front of my eyes.” So I know what I don’t want to do …Watch this space! 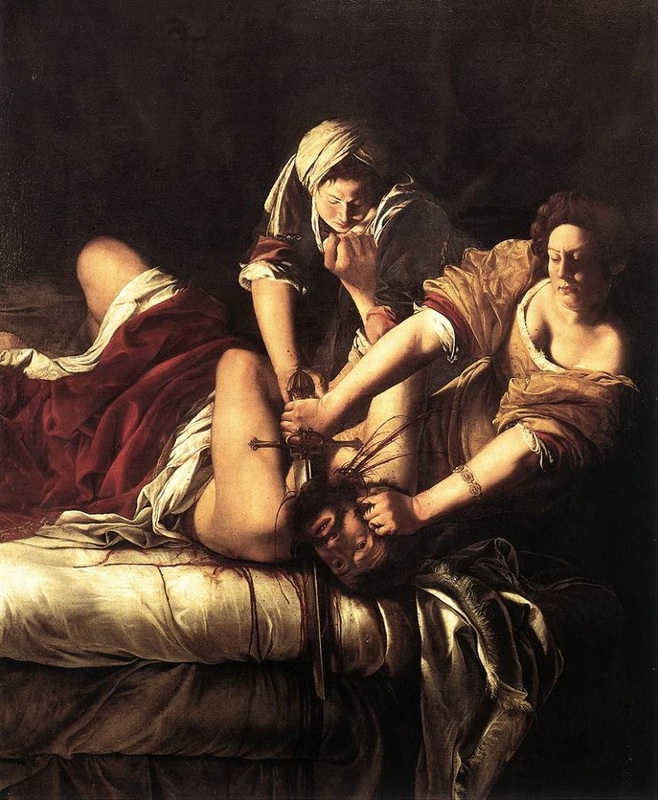 I want two at least: Gentileschi’s Judith slaying Holofernes; and Charity by Cranach The Elder. You can see more examples of Wendy’s work on her website.